I've been singing "rain, rain go away, overgrown Nava want to play". But you know how stubborn things and people are? Even rain. When you least expect, when you have washed a big bundle of clothes and when you have spring-washed your car, the rain must come pouring down. Otherwise, how can our life be colorful? We sure need the colors? So with the rain, I'm bringing you a non-boring soup. Said before, I can't though remember how many times I have repeated like a parrot that rainy day is a soupy day. This vegetarian Indian style soup (Pumpkin Soup). 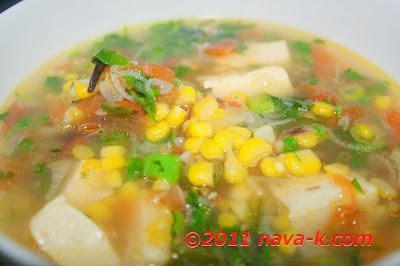 Corn, white tofu, spices, butter, spring onion and coriander leaves. Feel free to slurp in everyone. Bye for now. Simmer corn with 3 cups of water. Cook corn until soft, remove and let it cool down. Reserve the corn stock and carefully slice/cut corn kernel off the cob. Heat butter and when heated, saute shallots. Add spices, green chillies and tomato. Stir for about 2-3 minutes. Pour in corn stock and add tofu. 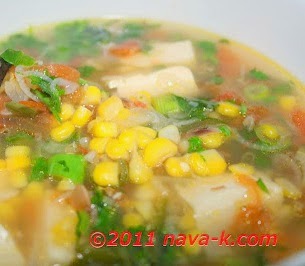 When soup is heated through, add corn kernels, spring onion and coriander leaves. Kucing - its not that spicy but yeh, replacing with pepper will be a great idea. The soup looks delicious! Must try it out one day. Hi Nava! Thanks for stopping by. It has been so hot lately and of course it makes perfect sense that I have been craving soup. This looks delicious! Do feel free to modify the ingredients as per your own taste. Healthy soup, I will try it soon.